So many readers of this blog are fountain pen fans and have been trying to get me on the bandwagon for the longest time. Well, the time has come to get my seat ready, because I am really enjoying this Lamy Safari I ordered from JetPens a couple of weeks back. Fountain pens always looked beautiful and interesting to me, but I had stayed away mostly because I felt I didn't have much use for them. What good was spending that much money on a pen that was just going to sit in a drawer and collect dust? If you couldn't tell by the majority of my reviews, I am a micro-tip ink pen fan, and fountain pens are big and messy, right? But the more I read about them, the more I felt that I could get proper use out of one, and the Lamy Safari looked right up my alley. In looking at the models available, this "Lime Green Body with Chrome Clip" really caught my eye, and as good as it looks on a web page, it is even better looking in person. The plastic barrel is sturdy and looks like it could take a pretty good beating, another concern I had with fountain pens. I also wasn't sure what nib size to order, but this one came with a fine nib and that is working out great for me. I think any nib size larger than that would be out of my comfort zone, and the next one I order (yes, there will be more) will have an extra fine nib. 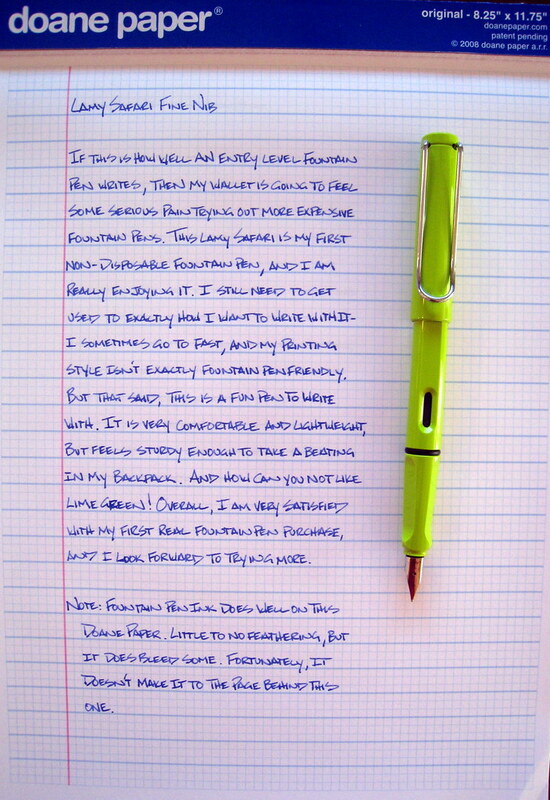 As expected, the ink flow is excellent, and the writing experience couldn't be smoother. I am going to have to tweak my writing style a bit to get the best use out of this pen, because one thing I found is that with my normal writing style and angle, my south-to-north strokes come across the nib a bit and I lose the ink on occasion. Nothing I can't correct, and heck, maybe having a fountain pen will make me want to work on my cursive handwriting again. Overall, I couldn't be happier with my first non-disposable fountain pen purchase. And unfortunately for my wallet, I think there will be more to come. Posted on November 24, 2008 by Brad Dowdy.